We are a one stop shop – everything you need for the management of your home, count on us. We know that Americans want to live in affordable, single-family homes, and in this economic climate, mortgage approvals are increasingly difficult. The good news is that there is a new option – Build US Back®. Now families have the opportunity to rent beautiful homes in safe neighborhoods. We believe that regardless of past homeownership experience, people deserve a chance to live comfortably without fear of foreclosure, eviction and unnecessary repairs. Build US Back® brings together a full-service team that supports you all the way. When you fill out an application we immediately get to work finding your perfect rental home. All of our homes are thoroughly maintained by our very own Build US Back Construction® team, so we know they’re in excellent condition for our tenants. An excellent Build US Back Property Services® staff makes sure any repair needs that arise during your rental term are handled quickly and measure up to our high standards. Our parent company, Transcendent Investment Management, is a fund for Americans to invest in America. Our investors believe in you and the dream of homeownership for all Americans. Our group is comprised of top professionals in the fields of real estate, investments, construction management, and customer service. Transcendent entrusts Build US Back® to purchase, renovate, rent and manage great homes, so you, our tenant, can live in a safe and comfortable home. And if somewhere along the way you want to purchase a home, Build US Back Realty® will be there to help you achieve that as well. 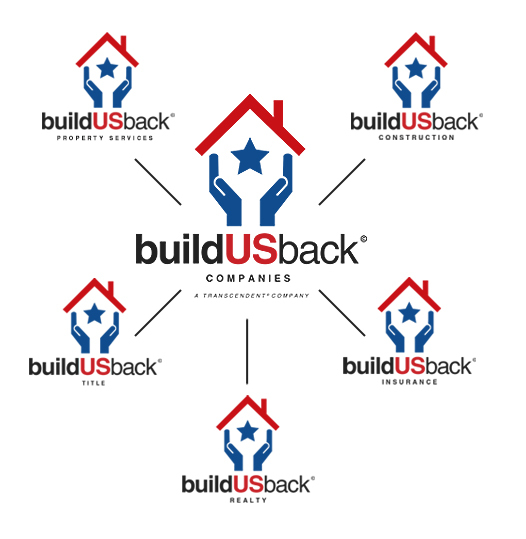 Build US Back® offers a full range of insurance services including; home, auto, life and more. Your insurance needs are important to us because they are an important part of your financial stability. Our insurance agents will review your personal situation and recommend a solid plan to protect you, your family, and your assets. We see your rental home as one of our most important assets. That’s why we take great care of each and every one of them. Our Property Services Division maintains all our properties in excellent condition because they reflect our priorities and give our tenants a comfortable home to live in. When you’re ready to purchase a home, Build US Back Realty® can help you find the perfect one for you. Our realtors are well versed in finding great homes at affordable prices. You can count on their experience while navigating through the home buying process. Build US Back Agents® and Associates are licensed, qualified, and use the latest tools and technologies. Our experts can save you time and money because they already know the neighborhoods that interest you most. Buying or selling a home is often the largest financial endeavor you will undertake. The professional services of a title company can be a great help when handling this complex transaction. Build US Back Title® can help you complete this detailed process and ensure your transaction goes smoothly.